Ajoint U.S. Air Force and Defense Advanced Research Projects Agency (DARPA) projectis moving speedily along--intended to fly to Mach 20, plus some. TheFalcon Hypersonic Technology Vehicle program is exploring high-speed airvehicles designed for rapid, around-the-world reach. 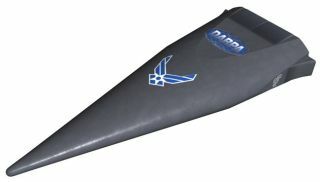 Project goals are todevelop hypersonic technology for a glided or powered system, as well asadvance small, low cost, and responsive launch vehicles. AFalcon Hypersonic Test Vehicle-1 (HTV-1) is now on the books for a less thanone-hour flight in September 2007. Attaining Mach 19 (19 times the speed ofsound), the glided air vehicle will briefly exit the Earth's atmosphere andreenter flying between 19 and 28 miles above the Earth's surface. Thisinaugural voyage of HTV-1 would end in the Pacific Ocean. TheFalcon HTV program is geared to showcase the ability of a craft to attainhypersonic speeds - ranging from 6,000 to 15,000 miles per hour (Mach 9 to Mach22), and reach altitudes between 100,000 to 150,000 feet. To do so willnecessitate an airframe structure designed to survive intense heat andpressure. Thereare other partners participating in the demonstration program: NASA, the Spaceand Missile Systems Center, Sandia National Laboratories and the Air ForceResearch Laboratory's (AFRL) Air Vehicles and Space Vehicles Directorates. Workis now underway to build the Falcon HTV-1's flight hardware components. Thetest vehicle will be integrated at a Lockheed Martin facility in Valley Forge , Pennsylvania. AFRL'sSpace Vehicles directorate, located at Kirtland Air Force Base in New Mexico, is specifically focusing on technologies for the glided system and issued aJanuary 25 background release on the hypersonic work. Technologists there arehelping to develop a thermal protection system for the HTV structure to withstand3,000-degree temperatures and extreme exterior pressures - 25 times thoseexperienced by NASA's space shuttle orbiter. Othercritical technology to be investigated in the Falcon HTV work includes an allcarbon aeroshell. This outer casing must tolerate crushing pressures andintense heat. To keep the vehicle interior cool, an advanced multi-layerinsulation is being fabricated for long duration flights. In addition,researchers are designing tools for enhanced HTV navigation andmaneuverability. Asecond glided flight is slated for 2008 or 2009. That HTV-2 test would featurea different structural design, enhanced controllability, and higherrisk/performance factors during its high-speed journey. Like its predecessor,the system will reach Mach 22 speed, and then finish its one-hour plus missionin the Pacific Ocean. Alsoscheduled is a third and final flight of a Falcon HTV. That test shot isplanned for 2009 and will be a departure from the previous two demonstrations. Thistime the reusable hypersonic glider will lift off from NASA's Wallops FlightFacility, Wallops Island, Virginia. Screamingout of the area, the HTV-3 would be recovered in the Atlantic Ocean an hourlater. In addition, the HTV-3--flying at a maximum Mach 10 speed--would achievehigh aerodynamic efficiency and validate external heat barrier panels that willbe reusable. "Wehave made great progress and are on track for the first glided hypersonic testvehicle flight in 2007," said Russ Partch, Falcon HTV-1 project manager in theAFRL release. "It will enable a revolutionary capability to quickly respond toevents anywhere around the world." Partchadded that the HTVs will prove technologies for global reach vehicles that canget a payload to the area of interest quickly in support of the jointwarfighter. Theresults of the trio of HTV experimental flights are viewed as having asignificant impact in the development of future affordable, adaptable, andresponsive military delivery platforms and launch systems. Accordingto AFRL, the Falcon HTV program is expected--during the next three to four years--totackle challenges related to hypersonic flight by in-flight validation oftechnologies while demonstrating operationally responsive space lift.